With so many mice in the market, buying one is a difficult decision. There are many available which are not worth the price they ask for as some lack in features, while others do not have a long life. So if you are planning to purchase a mouse, especially for gaming purposes, this article is the perfect guide for you as it introduces you to the GM-M6880X, which is a great successor to the M6800. The GM-M6880X is a pretty big mouse, ergonomically designed to fit well in your hand. It weighs 100 grams and feels quite robust and balanced. The mouse is covered with a glossy black plastic body and rubberized grips. The rubberized grips over the body provide a firm grip on the mouse and prevent wrist strain and maximize comfort when used for longer periods. One rubber grip is the place where the thumb rests and the other for the ring finger. The right and left mouse buttons are also indented for the middle finger and the index finger to fit in. The left side of the mouse contains two buttons, which are by default forward and backward buttons. They are conveniently placed under the thumb and are beneficial to navigate forward or back through web pages or documents. The GM-M6880X sensitivity is handy when it comes to playing games like Call of Duty and Medal of Honor, which are FPS games with sniper modes. The sensitivity button is placed beneath the scroll button, which enables gamers to vary it from 800 to 1600 DPI on the fly. The 1600 DPI high-accuracy laser sensor provides consistent and reliable performance for controlled mouse movement. The improved laser sensor enables the gamers to hit the target accurately. The mouse has been built to last long. Even after several months of usage, you will find that its clicks and drags are as smooth as they were when it was newly brought. Moreover, it can be easily cleaned with a glass cleaner, which preserves its look and shine. 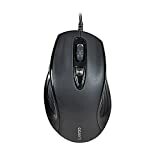 The GM-M6880X is a durable mouse with many of its users appreciating its smoothness and acknowledging that after using their mouse for so long, they have never encountered any issue with it. It is light in weight, around 100g, making it easy to use. The GM-M6880X is an excellent mouse for entry-level gaming and regular activity. It is ergonomically designed, making extended periods of usage a comfortable experience for the user. Its quiet-clicking scroll wheel and ability to work on just any surface make it a perfect choice for gamers. The GM-M6880X is the best budget gaming mouse designed by Gigabyte, providing all the essential features at an affordable price. Its users are highly satisfied with its overall performance and durability.